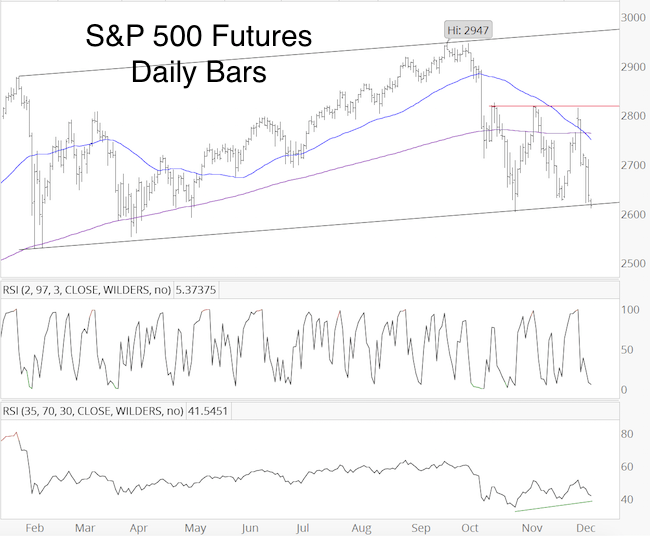 S&P 500: Does Low Fear Portend High Risk? 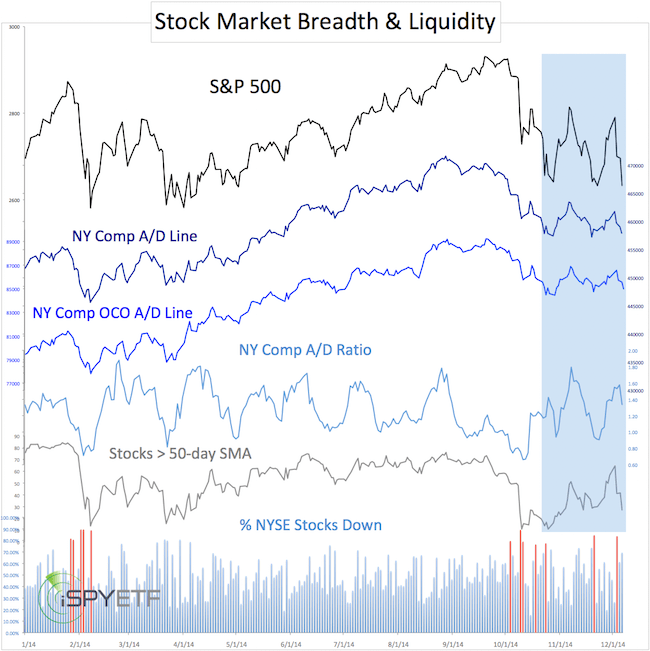 Below is a free excerpt of the December 9, Profit Radar Report, which takes a detailed look at various sentiment, liquidity, breadth and moment indicators to gauge the down side risk. Since this update is published out of context with all the other updates, an additional “Summary” section is provided at the end of the December 9 Profit Radar Report to provide bigger picture context. The S&P 500 closed at 2,633.08 on Friday. That’s only 1.99 points higher than the November 23 low. If the S&P would have closed at a new low, it would have been interesting to see if there are any bullish divergences. 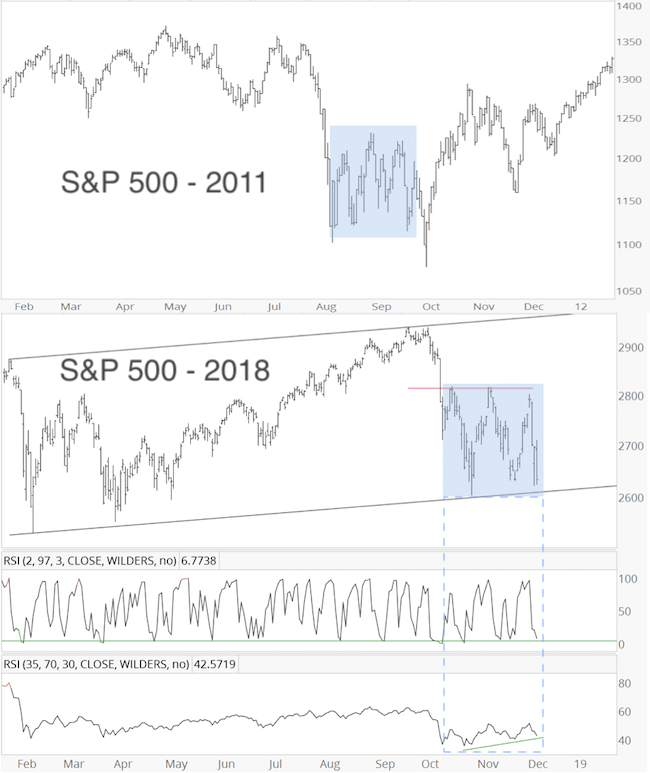 Well, futures are down 20+ points in Sunday’s trading, so let’s just pretend the S&P closed at new lows, and look for potential divergences anyway. The blue box highlights the price action since the September high. How about different sentiment gauges? 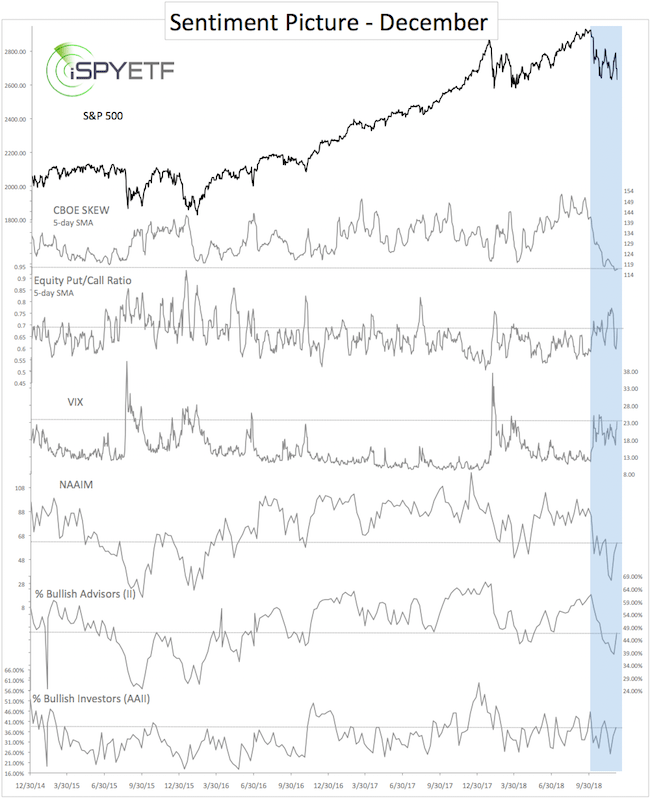 All the above indicators show that there is little panic, certainly less panic than in October or November. This could be viewed as either 1) a bullish divergence or 2) there is enough room for the market to fall further. Based on Elliott Wave Theory, the S&P 500 could be 1) nearing the exhaustion point of this down leg, or 2) be in a strong and sustained wave 3 lower (S&P could still rally towards or into 2,700s before next down move). The summary section below discusses which scenario is more likely. Another attention grabber was last week’s ‘death cross,’ where the 50-day SMA fell below the 200-day SMA. The last time death cross that received a lot of attention was in May 2016, when the 50-week SMA fell below the 100-week SMA. 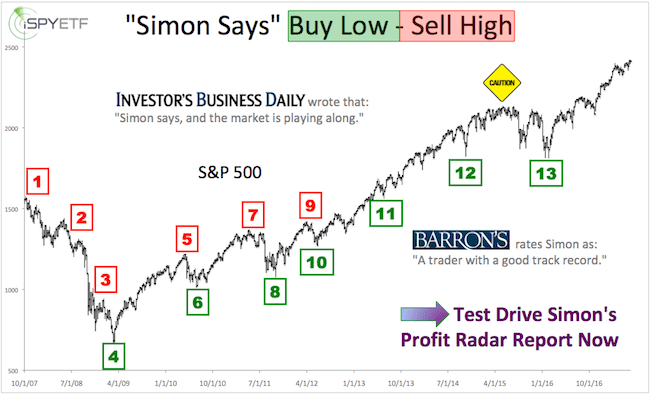 This was supposed to be an ‘irrefutable sell signal,’ but ultimately turned out to be one of the best buying opportunities ever. At best, SMA crossovers have a spotty track record, and we don’t base our anlysis on such lagging indicators. 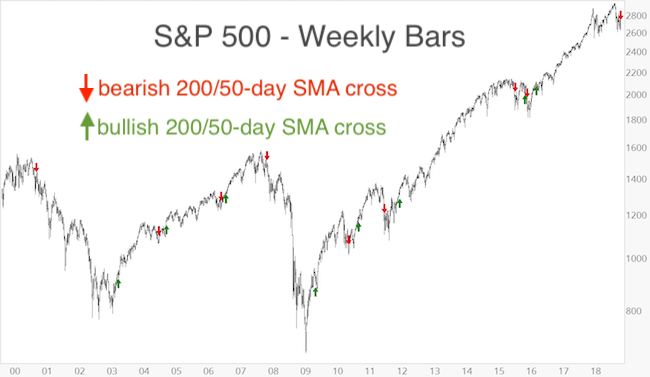 For those interested, the arrows in the weekly chart below mark all bearish and bullish 200/50-day SMA crosses over the past 20 years (weekly chart shown to capture longer-term history of signals). Shown below are various support levels that may help navigate the coming weeks, and answer the question posed above: What’ next? Sustained move lower, or quick wash out decline followed by snap-back rally? 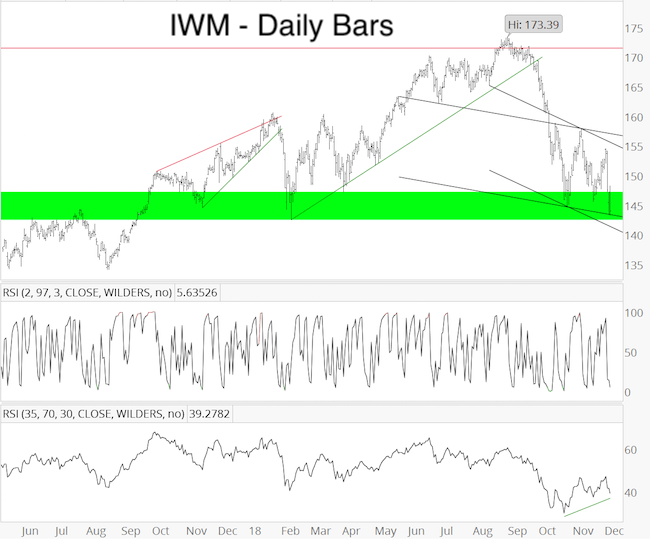 The Russell 2000 IWM is in the general green support range, with trend channel support at 143.25 and 141.30. A bounce from 143.25 – 141.30 seems likely, but sustained trade below the lower trend channel would unlock lower targets. 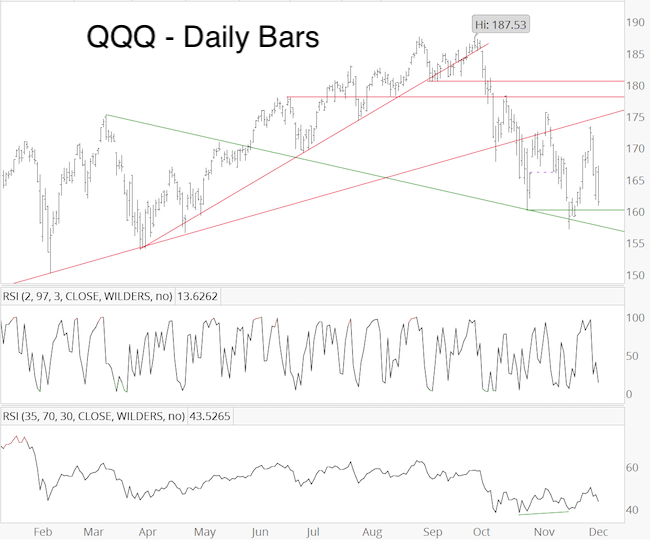 The Nasdaq-100 QQQ has a general range of support at 161 – 157. A break below, would likely lead to a retest of the February/March lows at 154-150. Summary: The above analysis was based on Friday’s closing price. The S&P 500 futures chart below includes Sunday’s 20+ point drop. Trade is right around black trend channel support. Anytime prices reaches support, odds of a bounce increase. Based on the Elliott Wave Theory structure, we are trying to figure out whether we are nearing the end of this down leg (with a potential wash out decline), or if trade will accelerate lower (as a wave 3 would). A brief drop (1-3 days) below 2,618 (with next support at 2,607, 2,550 and perhaps as low as 2,500) followed by a quick recovery would preserve the bullish divergences and suggest sellers got ‘washed out’ and a year-end rally is underway. Persistent trade below 2,618 and 2,607 means we need to allow for more weakness. 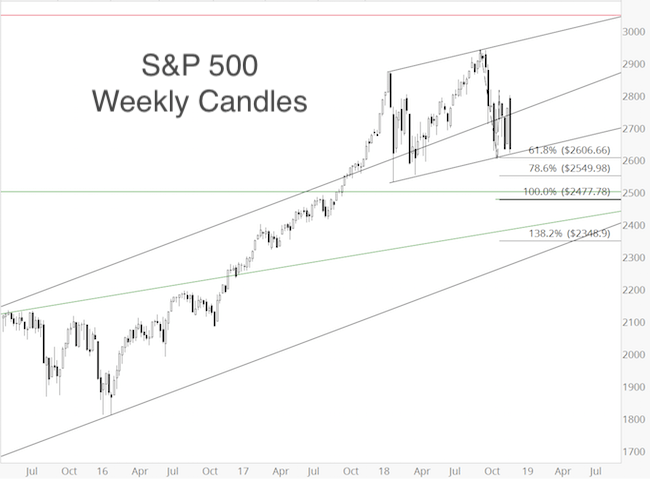 We will take a stab at going long (only with a small amount as this correction may carve out lower lows eventually) if the S&P 500 drops below 2,607 and subsequently rallies above 2,620 (stop-loss to be set at that day’s low). The SPY buy level is thus linked to the S&P 500 (approximate corresponding SPY levels: buy on drop below 261 followed by move above 262.10 with stop-loss at day’s low). The very first graph of today’s update (S&P 500 in 2011 – blue box) illustrates what a wash out decline may look like. SUMMARY: The lack of fear, expressed by various ‘bullish divergences,’ is likely to result in a short-term bounce. Back in September, we expected a correction toward 2,400, and that seems still likely (longer-ter S&P 500 outlook available here). A drop toward 2,400 (or at least below 2,500), would probably trigger the kind of ‘panic readings’ commensurate with a more significant bottom. 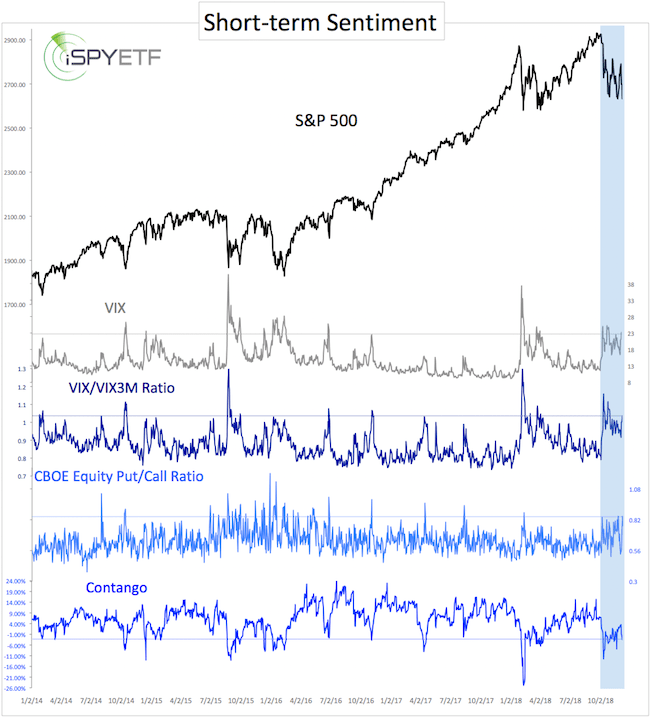 This entry was posted in ETF investing and tagged contango, S&P 500, sentiment, SKEW, VIX. your secret sauce keeps the market perishable – again, analysis by paralysis!